Considering my current work schedule, which has been B.A.N.A.N.A.S, I have been privy to more than one Asian Chicken Salad from McDonald’s. I know, I know. I have shamed all of you. Next thing you know, I’ll be making recipes out of a Sandra Lee cookbook. Get over it. It’s close to my house. It’s all assembled for me. It tastes less like crap than other things that take less than 5 minutes and 5 dollars to get. 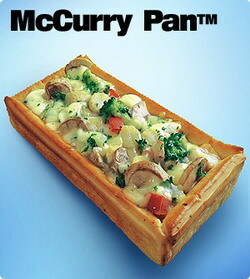 Let’s just say if the McD’s (or McDo’s as its called other places) had the above Veggie McCurry Pan available at McDo’s in India…I would want to be a frequent customer if I was still small enough to fit through the doorway. I wonder if my favorite Indian restaurant in Atlanta, Panahar, would consider making one of these for me? Inspired by what I saw on India’s McDonald’s site…I started browsing the menu of stores in other countries. Of course, the Japanese have to go and show us up. How good does a shrimp burger look? Not only do they have shrimp burgers…but they have super X-ray food probing glasses!!! 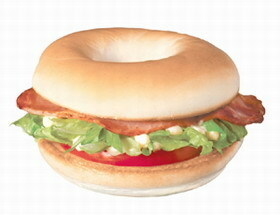 Those wacky New Zealanders have something totally drool-worthy on their menu – the McBLT bagel! I’d like to wash down their Chicken Tandoori sandwich with a nice glass of Sauvignon Blanc! ….and pair it with a goat cheese salad! C’mon McDonald’s…step up your game here. If you’re going to give us cheap, fast food that’s going to make us fat…at least make it yummy and different. Oh yeah…and hold the pickles, dammit. Fantastic post! I miss the Tsukimi burgers (literally translated, “moon burgers”- a burger w. egg) and the shrimp korokke burger pictured above. McD’s Japan also used to have bacon-potato pies, which were shaped just like the apple pies but filled w savory creamy potato and bits of bacon. I agree- America McD’s needs to step it up. Oh, yes those shrimp burgers are very good. I’d also recommend stopping by a Shakey’s Pizza while your in Tokyo. I found that the Japanese do not put much meat on their pizza, but the vegetables are a tasty variation. Fast food is one of those things that I know I should not support but do anyway. That being said all fast food is not equal in my book. Two places that stand out are Quiznos and Wendy’s. 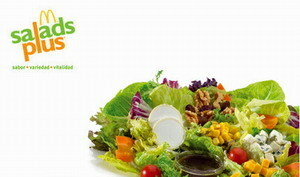 Quiznos has the Flatbread Salads ( http://www.quiznos.com/menu/salad_flatbread.asp ) and they now give you a real fork. Eating with plastic is no fun having a real fork makes a big difference. Wendy’s has the new roasted turkey & basil pesto sandwich ( http://www.wendys.com/food/Product.jsp?family=10&product=255 ) which is not bad. The truly nasty is Hardees and KFC. Hardees needs to stop with the current ad campaign it grosses me out. KFC is not much better with the new Cheesy Chicken Bowl ( http://www.kfc.com/kitchen/bowls.htm ). What are they thinking… maybe they’re not. I agree McDonald’s needs to step it up and they obviously mix it up with the other countries. I’m guessing that a large company like that would have heavy market research to target their offerings. I don’t know what that says about the US but it’s not pretty. Oh I miss all the non-western McDonald menu items. Ours are so boring here in Aus. I miss McDonalds in the Philippines where you could get an Adobo Burger or something like that. You should try Jolibee. I’m sorry, I just can’t see some 7 year-old boy from Topeka, KS asking for a McAloo Tikki Happy Meal. 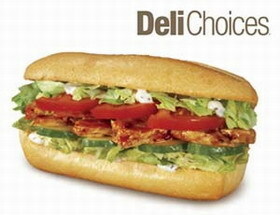 However, I would love to try the Chicken Tandoori sandwhich. To add to yr list, the McDonalds in Malaysia and Singapore serves chicken porridge and fish fingers. The porridge is actually really good too, very surprisingly. I moved to Buenos Aires, Argentina four months ago. In Argentina the menu is similar to the States but they have the McCafe which ia a little italian style cafe with the MOST AMAZING desserts. But sadly they don’t have apple pie which I really miss! Now, at Burger King it’s really different. They have milanesa sandwiches made from soy, and Churrasquitos which are sandwiches based on Argentina’s method of cooking on the parilla. In Chile they have a great Greek salad, and they also offer the burger without the bun with all the sides including nice slices of avocado. Incidentally here in Buenos Aires McDonalds is always busy but Burger King is usually pretty empty. 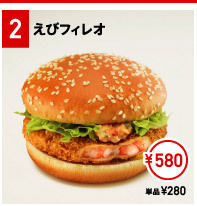 Hi Tami, i’ve actually had the Shrimp Burger at the McD’s in Japan. I was over there visiting in April-May. You can check out my food finds on the left side of my blog. Anyway, the shrimp burger is good! Nicely fried, flavorful pieces of shrimp. They also have shrimp mcnuggets… 4 for about $2.25. They look like tater tots but filled with shrimp! Nice posting. Great and hilarious post! 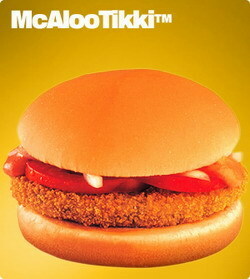 Over here in Singapore, I much prefer MOS Burger to MickyD’s these days. Their seafood kakiage burger has me saying, “I’m loving it.” MOS has also served burgers with rice buns for years. This year, MickyD’s started selling imitations — launching their rice buns as new and innovative. Yeah, right. 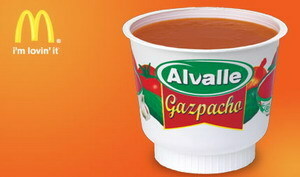 The “Gazpacho” is not portuguese, is SPANISH!